I have received a lot of messages asking why I refer to my current eating style as “plant-based” instead of vegetarian or pescatarian. I prefer that description for two reasons. First, because it isn’t limiting. A label tends to make me feel constrained by my choices and leave me focusing on what I can’t have. Secondly, it reminds me of what I should have in the spotlight of my meals- produce! It’s very possible to have a healthy sounding label (vegan, paleo, etc) and still not being eating in a healthy way. After all, potato chips and candy can be vegan, and bacon burgers with a fried egg on top can be paleo (if it’s wrapped in lettuce). I’ve always been a vegetable lover, but lately by training my mind to focus on the vegetable component of a meal first, I’m eating even more of them and really enjoying the freshness and flavor of my meals. There have been some challenges since shifting to eating this way, but over the past 7 months, I’ve really taken to it. The meals aren’t boring either! Here’s a peek into what I’ve been eating lately. I’ve been experimenting with different smoothies for the girls, but I just can’t seem to get myself away from the savory breakfast. Eggs and homemade sourdough seem to be a reoccurring theme, as are veggies. 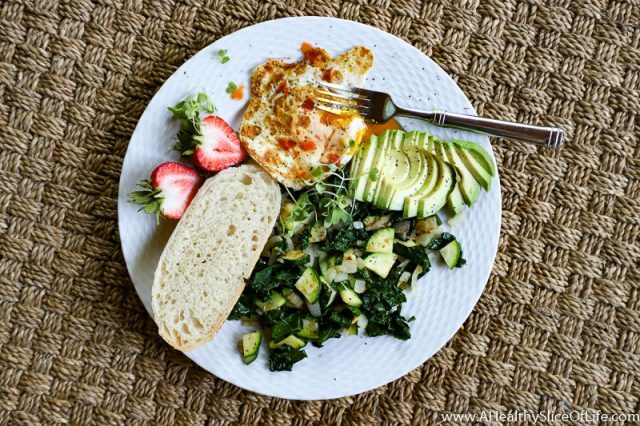 I love getting veggies in with breakfast. It just starts my day off on the right foot! Kale, zucchini, and onion saute with homemade sourdough, a fried egg, and half an avocado. Homemade sourdough with mashed avocado, lemon juice, salt, and red pepper flakes. Strawberries and mango. 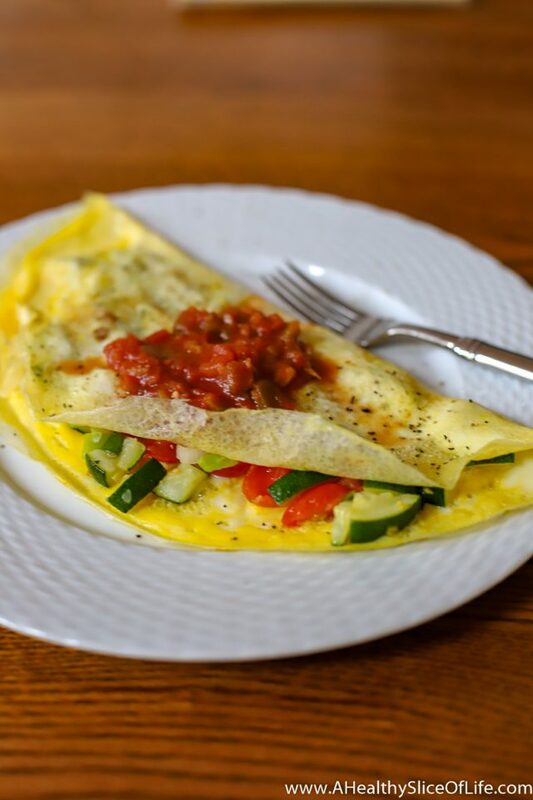 Sauteed zucchini, onion, and tomato inside an egg wrap with salsa. I tend to keep things light at lunch with wraps and salads during the summer. I’ve also tried to make more elaborate salad on Sundays to eat throughout the week, like the curried chickpea salad or the kale and quinoa salad (both from Oh She Glows Every Day). Also, I need to give a quick shout out to the Cilantro and Jalapeno hummus from Publix. 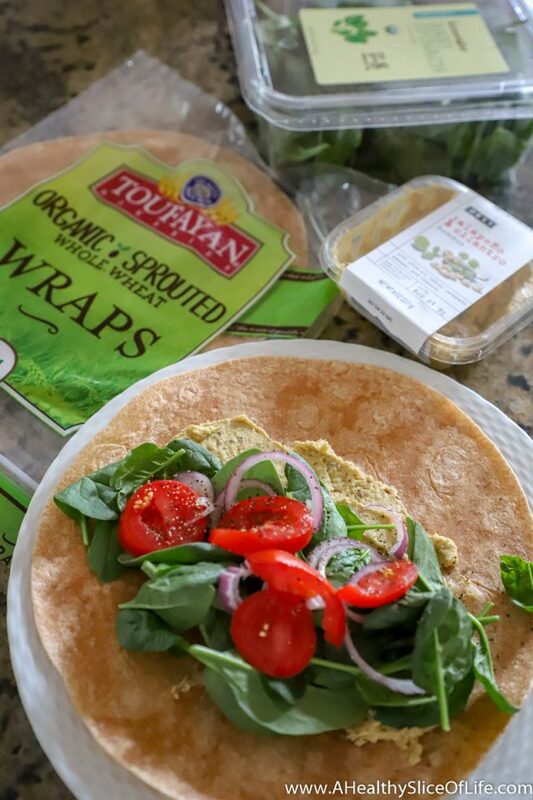 I haven’t grabbed it in forever, but I did a few weeks ago and it is the PERFECT hummus for veggie wraps because it has so much flavor in it that I rarely even need to add a dressing. If you’re bored with lunches and don’t mind a little spice, I highly recommend it. Cilantro and Jalapeno hummus on a wheat tortilla with spinach, tomato, and onion. Lunch out at Davidson Ice House. 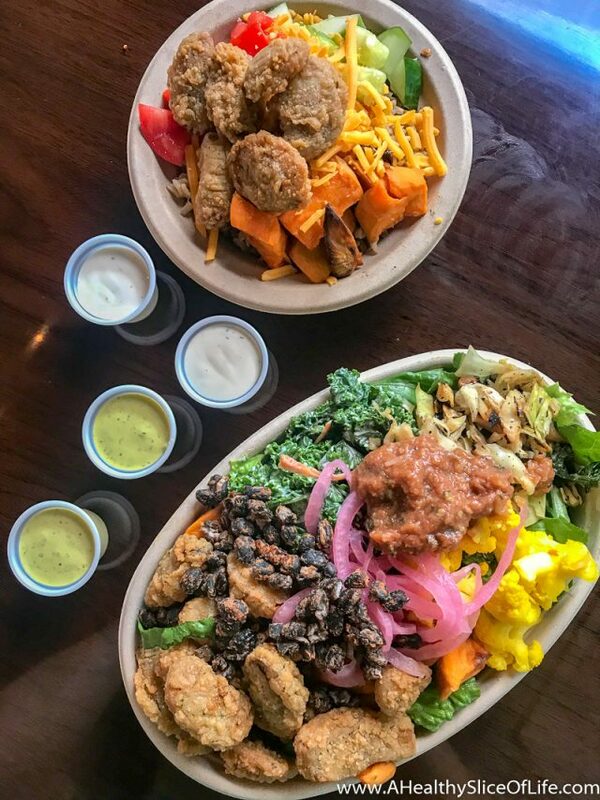 I don’t feel right saying that it’s like CAVA because I’m not sure who had the concept first, but it’s a create your own bowl kind of place with the freshest and tastiest options for all kinds of eaters (from vegan to meat-lovers). I had heard people raving about it and I’m so glad we finally got to try it out. We will definitely be back! 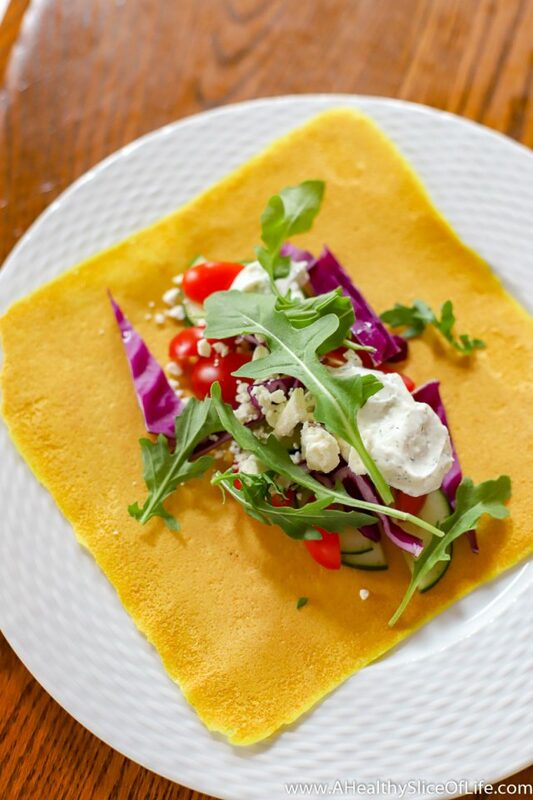 Cucumber, tomato, purple cabbage, arugula, and feta on a turmeric coconut wrap from Thrive Market (check out all my Thrive favorites here). 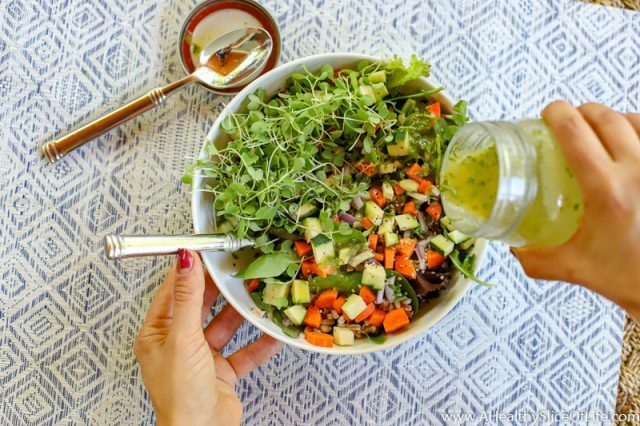 Mixed baby green, cucumber, carrot, farro, purple onion, hemp seeds, and microgreens topped with my Great Day Dressing. 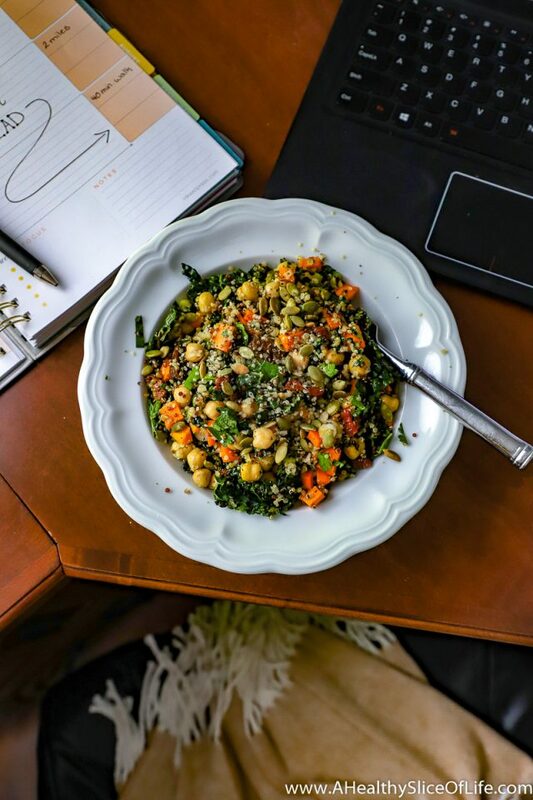 Kale and quinoa salad with chickpeas and sun-dried tomatoes from Oh She Glow Every Day. 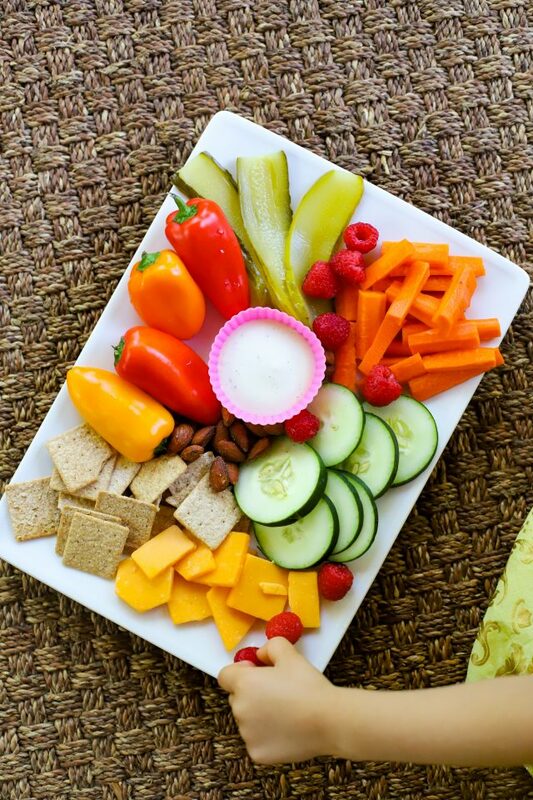 Summer is the perfect time to substitute meals with snack platters. No one is ever picky about a snack platter. It’s like a law or something. 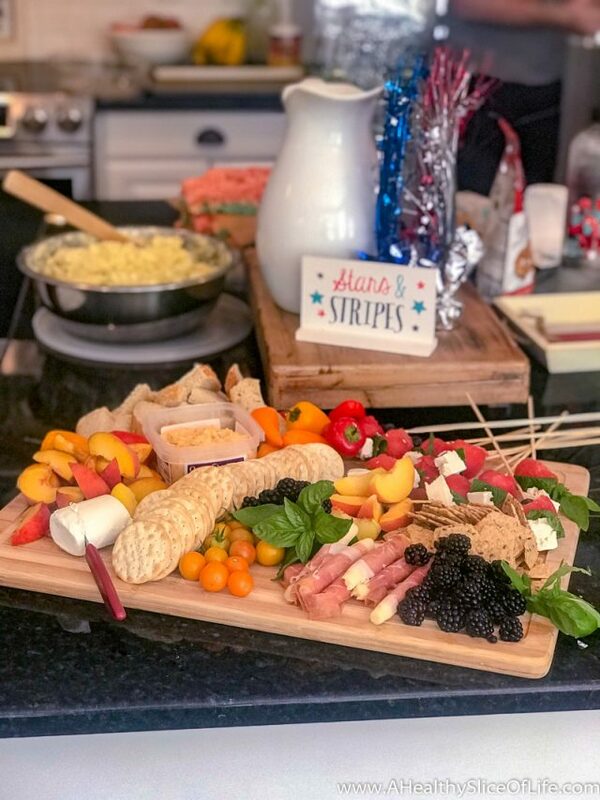 We’ve enjoyed many lunch snack plates and have enjoyed putting together larger platters for when we are hosting friends. I can’t take credit for the first beautiful spread, as it was put together by my friend, Tanya. Isn’t it gorgeous? The second snack plate features caramelized onion dip in the spotlight and if you haven’t tried it yet, what are you waiting for? It totally counts as a meal during these warm weathered days! Dinners are always my favorite meals to share because they are usually when I get the most creative and playful with what we eat. I’ve been trying new cookbooks from the library, scouring the internet, perusing Pinterest (follow me here! ), and just winging a lot of meals too. We’ve really enjoyed some tasty suppers as a result and here are a few of our favorites. 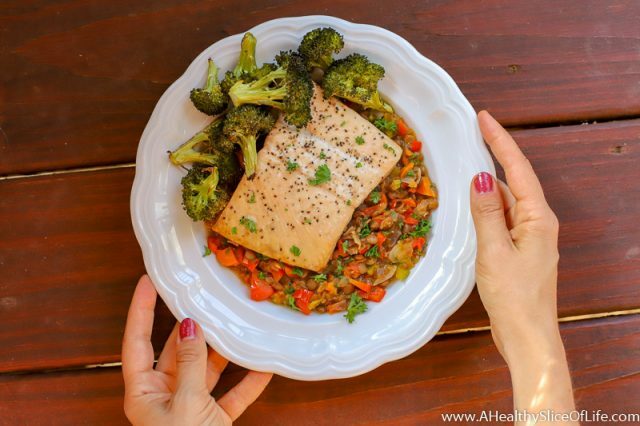 Roasted salmon and broccoli over a warm veggies and lentils from Williams-Sonoma Eat Well. These lentils were so good! I’m going to play around with them a bit and try to turn them into a main dish for fall to share with you. 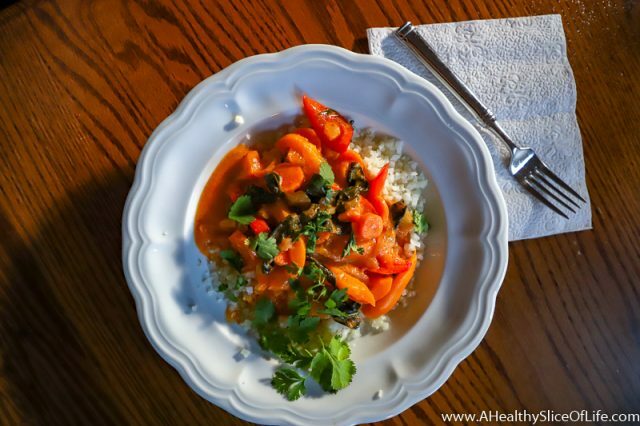 Thai red curry with vegetables over cauliflower rice. When I shared this on Instagram (follow me here! ), I received so many responses from so many of you saying how much you loved this recipe! 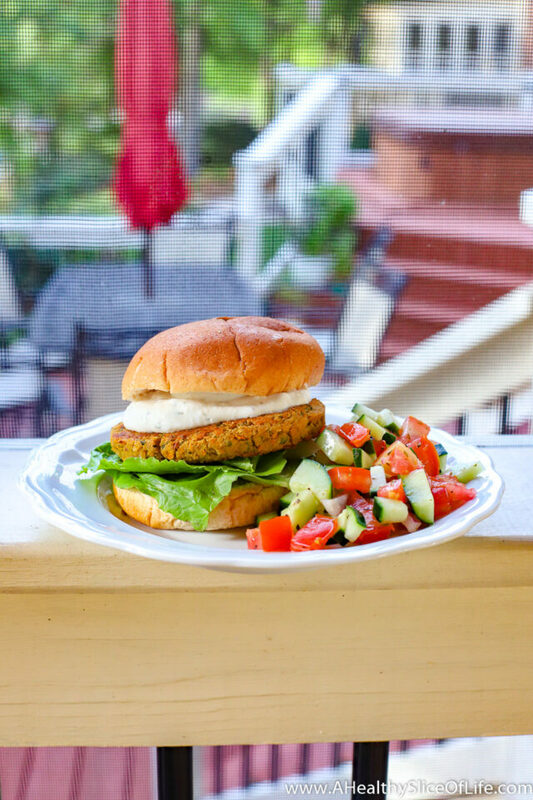 Beyond Meat Burgers (which have become a weekend cookout favorite for us!) with Farmhouse Culture Dill Pickle Kraut and roasted shishito peppers. I loved this meal! 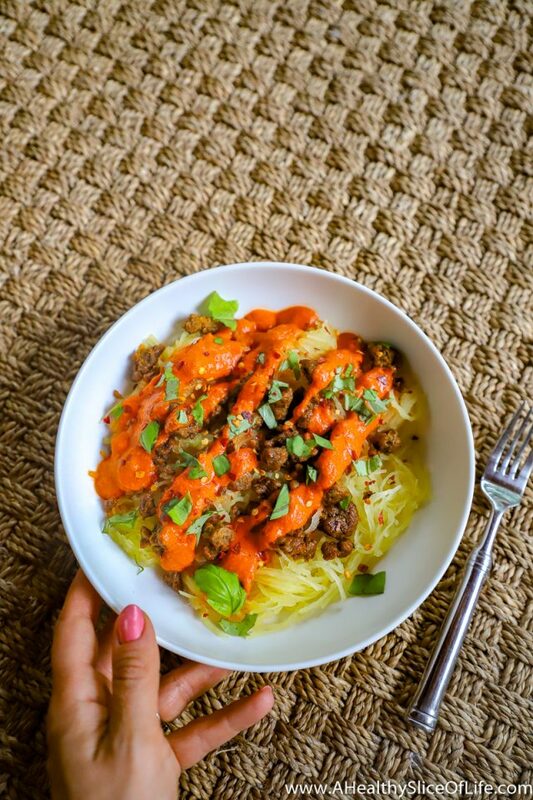 I roasted a spaghetti squash, then topped it with some chorizo seitan and red pepper cashew marinara and basil from the back porch. Maybe I was just extra hungry, but I devoured it! 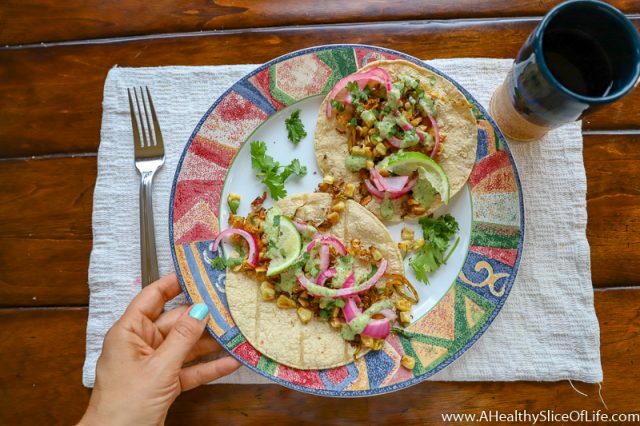 Brussels sprout tacos with charred corn and pickled red onions from Chloe Flavor. And as for what I’ve been drinking? Lots and lots of Berkey water; it really has increased our whole family’s water intake! Well that, and finding a water bottle I love. I’m curious, how do you (or do you at all?) define the way you eat? I’m looking forward to trying some of these! Thank you for taking the time to share them. Our mornings are rushed but I’m committed to waking up earlier to give the girls a good breakfast. Though some days it’s Cheerios and bananas 🙂 so we can get out the door by 7 am. 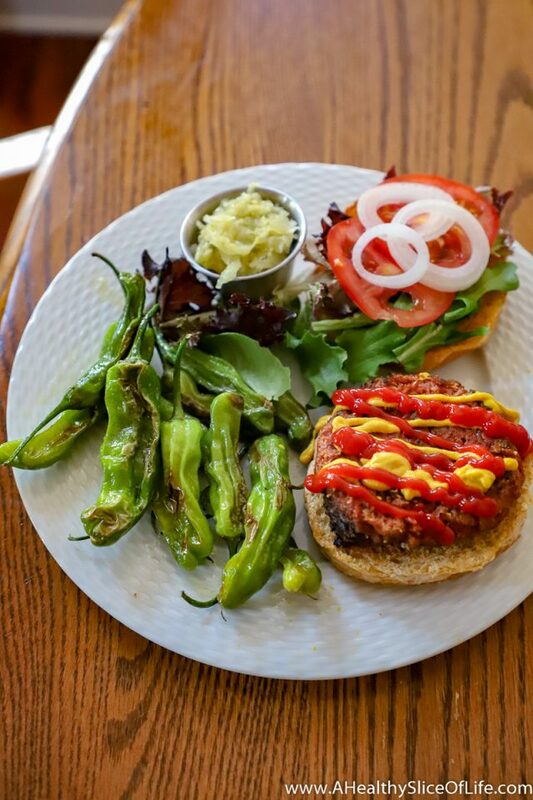 We tried those Beyond Meat burgers…..and in all honesty…..they are so beyond me! I just can’t go there. Hi Karen! I used to have two food processors (a large and a small), but got rid of my smaller one. While I did like it for dressings, I felt like having two was taking up more cabinet space then it was worth. Now I use my blender a lot of the time for small batch dressings and sauces and my large food processor for everything else. Though I could see it being worth it if you make a lot of dressings/sauces and don’t have a high power blender as an alternative. I hope that helps! Pregnancy will do that to you! 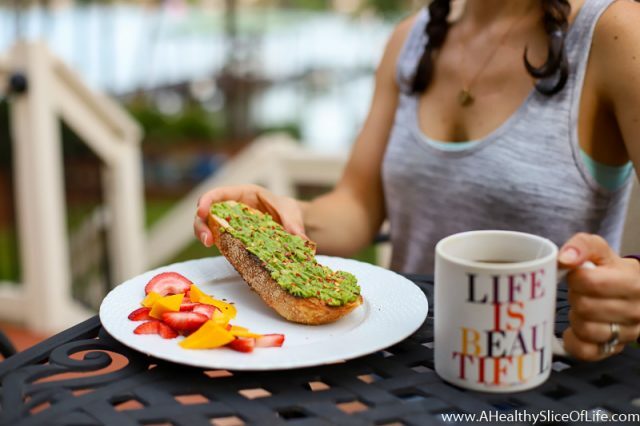 Bagels were my love language during that time 🙂 It sounds like you’ve reached such a great place with healthy and intuitive eating now; that’s awesome! Admire your knowledge and food preparation for your healthy family. It is a lot of work, but you seem to relish role you have as “chief chef”! 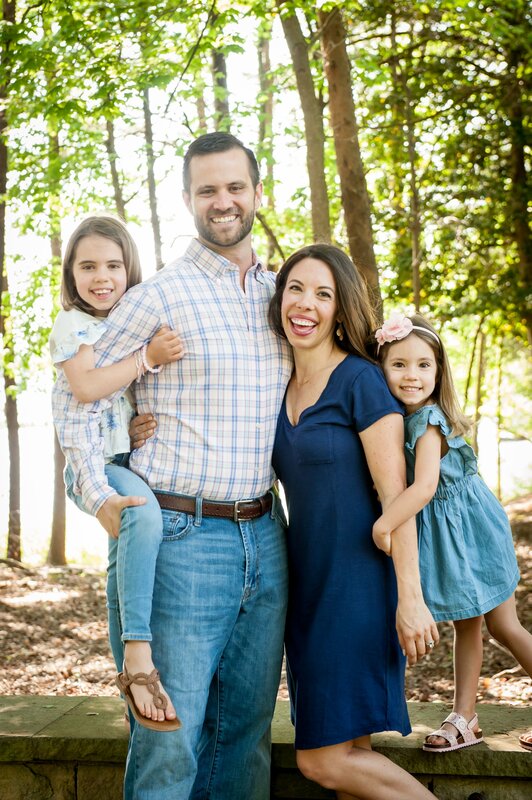 John J. recently posted..What Healthy Families Do To Create Strengths In Their Kids! 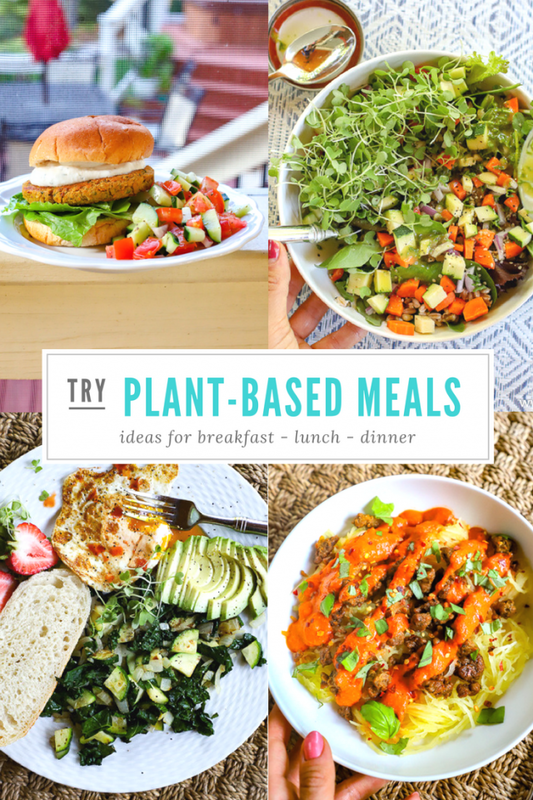 I don’t have any food restrictions and I don’t label the way I eat, but I do think everyone should have a “plant-based” diet in the sense that everyone should be eating a ton of fruits and vegetables! I eat plenty of meat and carbs, but I feel most satisfied and energized when my meals also include a lot of produce. Those look like some delicious eats! While my family is far from vegetarian, we do prioritize vegetables and fruits in our diet. My two have autoimmune disease and are on a medically prescribed diet. So we do have a label for it. It provides us community with others doing the same thing. One child also has a ton of allergies so my thoughts on the way one eats is do what works for you is best. We are all so different! You may have addressed this already but is David also eating vegetarian full-time? Yes he is and to I never would have guessed it, but he is preferring it for right now. He’s had meat here and there but feels like garbage when he eats it. Great food choices! 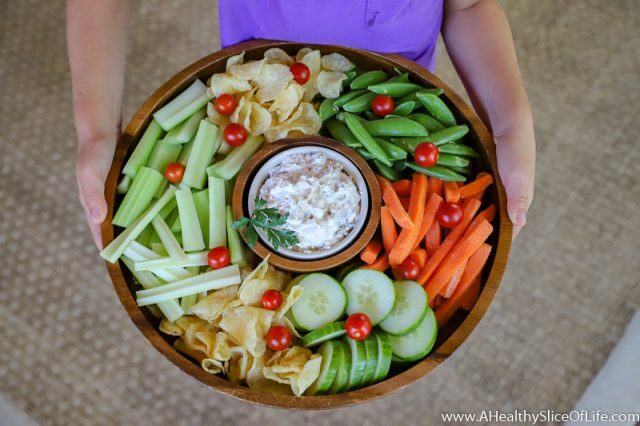 I would love to try this at home — especially your snack platter. I think the kids will enjoy. Thank you for sharing.